French Green Clay, also known as Illite Clay or Sea Clay, is one of the most effective, high quality mineral clays available. It naturally comprises valuable elements, including montmorillonite, several (up to 9) important mineral oxides, magnesium, calcium, potassium, dolomite, silica, manganese, phosphorus, silicon, copper, and selenium. The green colour, which is due to the iron oxide content and decomposed plant matter, can indicate a good or poor quality clay. 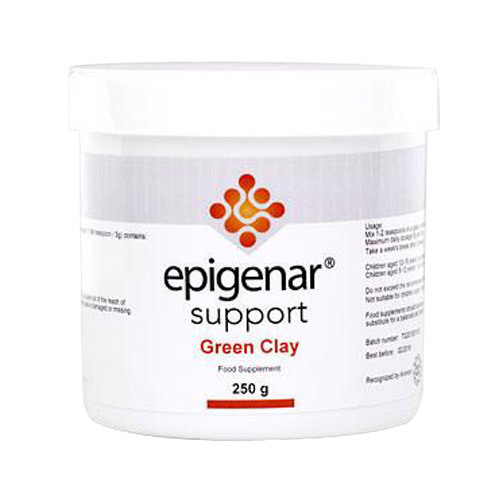 Green clay powder may be used externally only, as a face mask or to draw out toxins anywhere on the body. Mix the clay with an equal amount of water and allow to stand until the water has been absorbed. Drain way any excess water and apply the paste to your face and/or body. Allow to dry and then rinse off with lukewarm water. Keep dry and at room temperature, out of the reach of children. 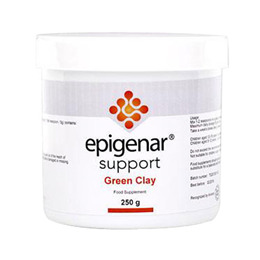 Below are reviews of Epigenar Support Green Clay - 250g by bodykind customers. If you have tried this product we'd love to hear what you think so please leave a review.